Executive Branch, Amendments, Electoral College, Checks & Balances, More! 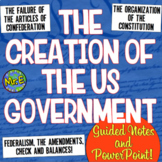 Also included in: American History COMPLETE Guided Notes and PowerPoint Bundle: 12 total sets! 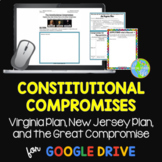 Students can use the graphic organizer and sentence frames to compare the Virginia and New Jersey Plans of government introduced at the Constitutional Convention. 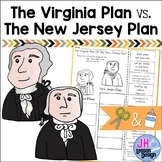 This is a great packet of information about the Virginia Plan, New Jersey Plan and the Great Compromise. It includes charts, graphs and a political cartoon. Questions are high level response, short answer questions. 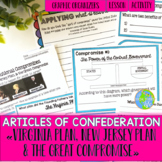 These are a set of comics, definitions and activities for students to understand the Virginia Plan, New Jersey plan and the Great Compromise. Great Compromise Webquest (Virginia Plan vs. New Jersey Plan) With Answer Key!